By December 22, the Moon will be in Scorpio and approaching its Inaugural 2009 crisis degree of 29Sco45--our financial troubles continue. Here you see the Winter Solstice Moon in 2nd house in the chart set for the White House (fluctuations in finances), and with the Jupiter/Saturn opposition poised upon the 2/8 money axis, we may expect Capitol Hill's ideology-driven expansion v restriction/generosity v austerity arguments to continue during winter season 2011/2012 as certain entities work to dismantle America, and politicians pretend they're unaware of this long term, traitorous project. As you see (click chart to enlarge), the November 25, 2011 Solar Eclipse @ 2Sag25 sits upon Winter Solstice 2011's 3rd cusp of Communications in DC--this 'peculiar turn of events' eclipse timed the 'Super Committee' which "failed" as most people expected it would. Personally, I think it did what the powers-that-be wanted it to do but that topic is beyond the scope of this post but one reason I say this is that setting up a 'Super Congress' undermined the US Congress and its oversight function. Here's a post showing both the Lunar Eclipse and Solar Eclipse horoscopes of November 25 and December 10, 2011. Then today, President Obama speaks in Kansas in an attempt to echo a famous and important speech delivered by Teddy Roosevelt. But as you know, present presidents courting comparisons with past presidents is always an iffy political risk! 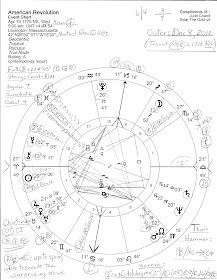 Horoscope shown: Winter Solstice December 22, 2011 12:30 am est White House, Washington DC; it's an Hour of feisty Mars at crisis degree (17Vir) and working busily in the 12th house of Politics, Karma, Self-Undoing, and Large Institutions. This may describe President Obama's health care legislation (Virgo) as a continuing target of his martian opponents on either side of the aisle. No planets are out-of-bounds so all actors (planets) are on the earthly plane and participating in their various ways; it's a Balsamic phase of the Moon (326:01) when things can go bump in the night and often do. It's possible that a hidden Mars in 12th H is up to no good in the house of Politics. However, Mercury makes no aspects at all to any planets in the chart so its position in one of its natural houses (3rd) emphasizes mercurial pursuits such as messages, speeches, and transport, along with its sign placement--here, in Detriment in expansive, broad-viewing Sagittarius. Hopefully, our soldiers will return from abroad as safely as possible. 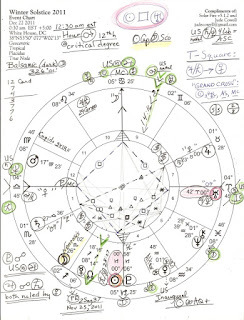 The presence of America's natal Saturn 14Lib48 and Neptune 22Vir25 (conjunct President Obama's natal Mars) snugged around the Solstice 2011 ASC gives a midpoint picture of some concern: Sat/Nep = ASC: limitation of freedom; oppressive circumstances; depression. Chart-ruler Venus 1AQ48 is in 4th H (Real Estate; the Homeland; Environment; 4/10 is the Security/Career axis) conjunct Fixed Star Altair (the Eagle--the Sun rises with Altair at this time of year) and near US Inaugural Sun 00AQ+--the president. Then Jupiter's Direct Station occurs on Christmas Day 2011...will holiday consumer sales pull a large enough rabbit out of America's financial hat? 1. Venus sesquisquare Mars (0A34; 135 degr, a complex, interlaced square--octile = 8) indicates intense, dynamic interaction between them--between the White House and activist Mars, frustrated in Virgo, and active in the Behind-the-Scenes 12th H.
On one level, the Pentagon and US military are described here by warring Mars in the house of Large Institutions; protesters such as those in the Occupy DC movement may also be denoted and show the complex relationship between the democratic forces of the 99% Movement and the president's political considerations and limitations; secret enemies are also indicated by a 12th H Mars; along with equipment breakdowns. 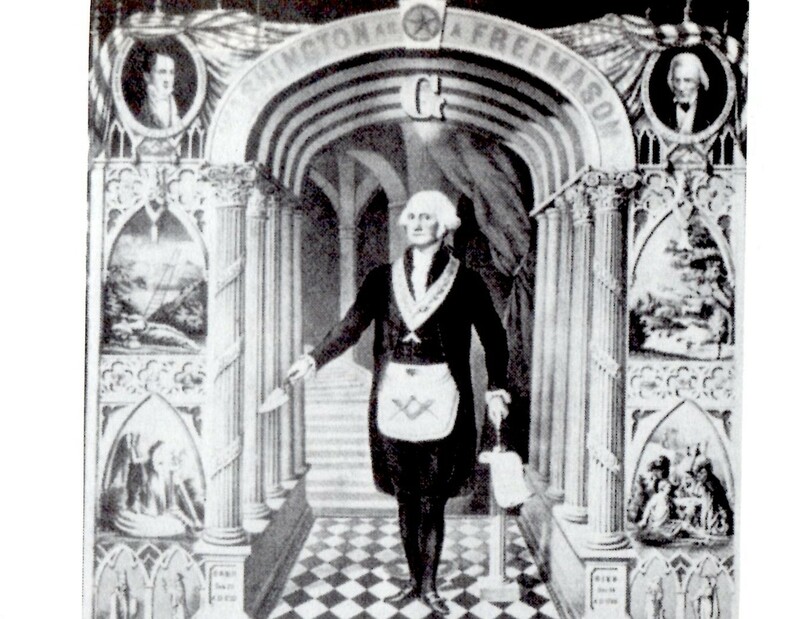 Plus, wealthy Pluto 6Cap58, planet of secret manipulation, sabotage, foreign bankers and cabalists is at the Foundation of the Solstice 2011 horoscope--it's the closest planet to an angle, in fact, and thus prominent. Pluto's transformation and destructuring of our country continues to undergird the basic problems we face with Mars and Pluto ruling 2nd H of Values and Earning Ability bwo Scorpio on 2nd cusp; the plutonian EU debt crisis affects America's bottom line (4th H) and the world's hopes for recovery. What's Rising in First House? And Where Is Fraudulent Neptune? Saturn in 1st H (plus, US natal Saturn rising) shows limiting, inhibiting conditions and many delays with a potential for losses; since Saturn here is ruled by Venus, issues of deflation/inflation/stagnation are on our 2011/2012 menu. Plus, as you see, nebulous Neptune remains within orb of US natal Moon with its sense of rootlessness, foreclosure and homeless conditions, and Fraud to The People. Floods, other natural disasters, and water-gas-oil-related matters remain potentials as well. However, in spite of it all, the star of our Solstice Show, Sun 00Cap00:00, trines fortunate Jupiter, an aspect which may aid matters since such enthusiasm, optimism, and confidence can lead to breakthroughs of good fortune. And everyone knows that the NYSE depends on confidence! However, a Sun/Jupiter trine doesn't seek challenges and may even be lazy yet this energy can provide a boost to those who do seek or work with challenges and may harmoniously improve relationships--and the 1st house Saturn, exalted and strong in Libra, may provide strength for this easy (lazy!) aspect to manifest improvements especially in the action-oriented Cardinal signs of Capricorn and Taurus. "Wealth indicator, the Sun/Jupiter trine, helps with public relations as well for optimism always 'sells' in America yet the aspect indicates a certain apathy with a desire for only moderate demands to be made upon his time and freedom. Can a White House schedule provide him this?" Read more on Mitt Romney if you wish. Obviously, the energies of the Sun/Uranus square at Cardinal Points of world manifestation tell a tale of self-willedness, eccentricity, authority issues, and perhaps unprincipled behavior; plus, a strong desire for power is noted--and a Sun/Uranus square is also found in the natal horoscope of Mitt Romney! Pluto/MC = ASC: procuring an important position of recognition no matter the conditions; a person of fame. 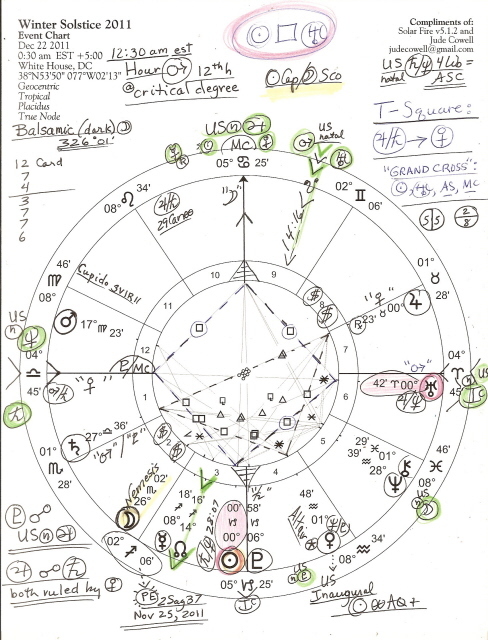 Jupiter/Pluto = ASC: far-sightedness; prudence (in DC?!! jc); organizing talent; a desire for power; personal advancement; focusing on how to use and discard other people; added self-importance; ego definition; reading the intentions of others especially if they seek power. Well, I for one, am an American who does not 'seek power' so if politicians want to 'read my intentions' they have only to consider that America is my only nag in the race--a race that many actors in Washington are determined to handicap until our nation, government, and social safety net are dismantled and we cry out in unison for a 'New World Order' of totalitarianism and feudalism. Sun/MC = Uranus: revolutionaries, rebels, anarchists; a sudden change of objectives; inner conflicts; on-the-job training. Sun/MC = ASC: increased need for honesty about how to help the lives of others; associations. Sun/US n Jupiter = Uranus: speculation; gambling; a sudden turn or success. 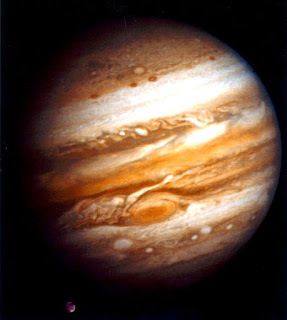 Sun/US n Jupiter = ASC: devotion to social aspirations; shared success; meetings. Jupiter/Neptune = Uranus: imagination v reality; sudden recognition of a difficult situation; coming down to earth with a bump. And that bump may occur during the Moon's darkened Balsamic phase here denoted in the Horoscope of Winter Solstice 2011. Considering the rampant fraud in Washington DC, on Wall Street, and elsewhere, can new scandals and leaks be very far behind? As always, you are cordially invited to leave your on-topic opinions and remarks in a Comment! Be advised that all spam is moderated and deleted. Sun Cap/Moon Scorpio blend of energies. Thom Hartmann, Move to Amend (sign the petition refuting the undemocratic Citizens United ruling of the Supreme Court in Jan 2010), Democracy Now!, and Max Igan's The Crow House where you may wish to read about Trust Law...because We-the-People ARE the law!